women’s basketball win to starting her own nonprofit, she attacks each new endeavor with equal measures of hard work and positive attitude. 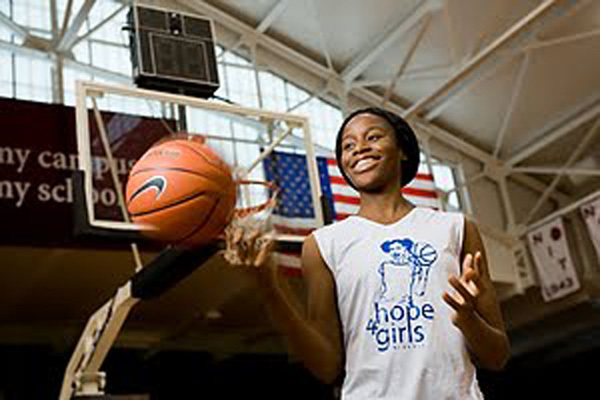 After working as an accountant at ESPN, Akiode returned to her native Nigeria to found Hope 4 Girls Africa, through which she is working to impart her can-do spirit to a whole new generation of African women, helping them build confidence and identity through the power of sports. Sports have become such a big part of your life. How did you get into basketball in the first place? took me to greater heights than I ever could have imagined. But I played because I loved it—the friends I met, the travel, everything. Speaking of greater heights, what was it like to play at the Olympics? Really, it was the craziest thing. You have the greatest athletes in the world living together on what is basically like a college campus. For someone like me, who came from a humble background, there’s nothing greater than the Olympics. It gives you this confidence that you can really achieve anything. What’s your vision for Hope 4 Girls Africa? price of education in Africa is such that it’s possible to send ten kids to school for a couple thousand dollars. The possibility for changing lives for the better is definitely there. Why do you think sports help peoplefind their niche? Sports don’t discriminate. They don’t say, “You’re poor, so you can’t play,” or “you’re ugly” or whatever. They’re classless. They take in all who come, and in their purest form, sports are a powerful way to unite people. There’s nothing better than being a part of something like that, especially for girls coming from tough backgrounds. You’re such a powerful role model. Who’s served in that role for you? I spoke a few years ago at a Fordham panel for student-athletes. Christine Driessen (CBA ’77), executive vice president and chief financial officer of ESPN, was there and fell in love with the speech. She knew I was looking for a job, and I studied accounting, which is one of her areas at ESPN. The rest, as they say, is history. I look at her as a great role model, especially as a woman who has reached the level she has in sports, which is always a male-dominated field. I’ve always aspired to do that in my country and continent. It must have been quite a speech. I think I still have it somewhere. I’m going to frame it. That is the speech that changed my life. Seriously.